Back in June a House committee wanted answers about IRS efforts to indimidate and silence Tea Party Groups. 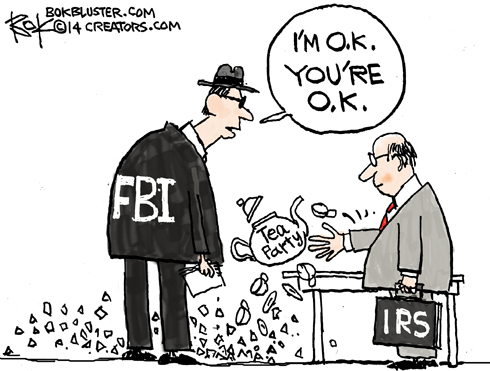 Lois Lerner, the IRS Director of Exempt Organizations took the fifth. There was very little Tea Party involvement in the campaign 2012 campaign. President Obama was re-elected. The FBI has now declared “no harm no foul”, as Dan Henninger puts it. Thus, two of the most powerful public institutions in the U.S.—the FBI and the IRS—have concluded no harm, no foul, and the memory hole swallows the Obama administration’s successful kneecapping of the GOP’s most active members just as they prepared to participate in the 2012 presidential campaign. Many—ruined or terrified by the IRS probes—shut down. Mr. Obama won.